A few weeks ago a friend of mine called me up and asked if I fancied going to the Gallery of Modern Art here in Edinburgh. Now, anyone who knows me knows that this is code for ‘let’s go eat some cake!’. The National Galleries of Scotland do a mean scone, but on this occasion I had a ginger flapjack. It was immense (both in size and taste) and I decided that this was something worth recreating. However, the original was a bit hard, so I was after a slightly less chewy, possibly a bit more nutty, flapjack base, and a topping with a bit more of a kick to combat the sweetness of the golden syrup. Then last week a found a recipe for something that looked vaguely similar, and decided to recreate that amazing gingery-sticky-gooey moment of goodness. This is adapted from a GoodFood recipe. 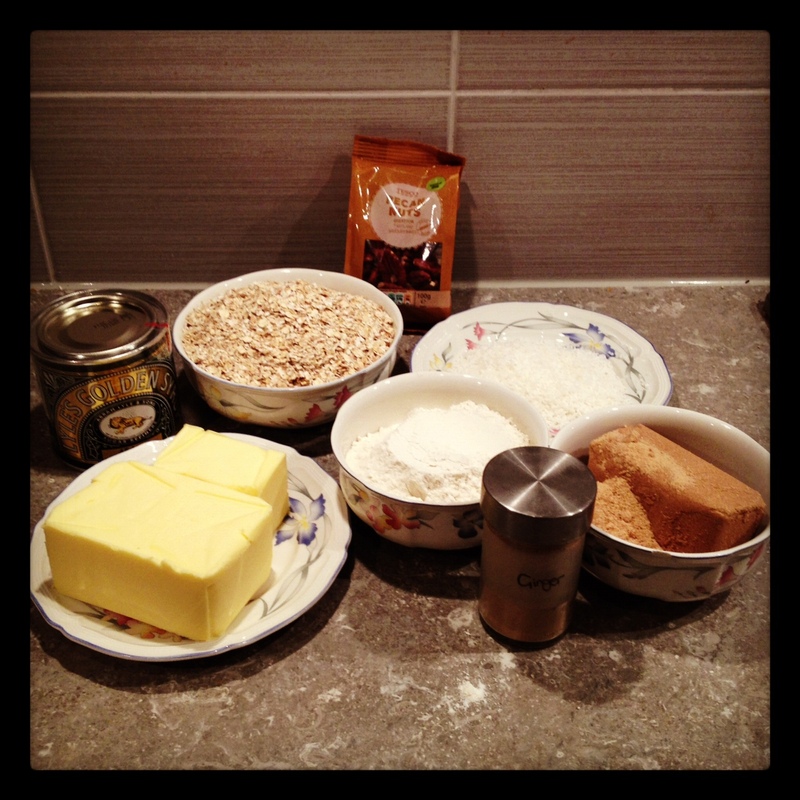 The flapjack base: all the basic ingredients of a traditional flapjack, including enough butter to block all your arteries. INGREDIENTS: 350g butter (sadly that is not a typo – quite literally not for the faint hearted), 200g light muscavado sugar, 5tbsp golden syrup, 250g rolled oats (porridge oats are fine), 140g plain flour, 50g pecans chopped into small pieces, 50g desiccated coconut, 1tsp of ground ginger. Turn on the oven, set it to 180 (fan) and grease and line a tin. I used one that is about 25cm squared and the flapjacks are quite deep, so you could easily use a bigger tin and make smaller pieces. The great thing about flapjacks is that they are the baking equivalent of one pot cooking! So start by putting the butter, sugar and golden syrup in a pan over a gentle heat. Don’t be tempted to turn up the heat to speed the process – you’ll just get a burnt mess. 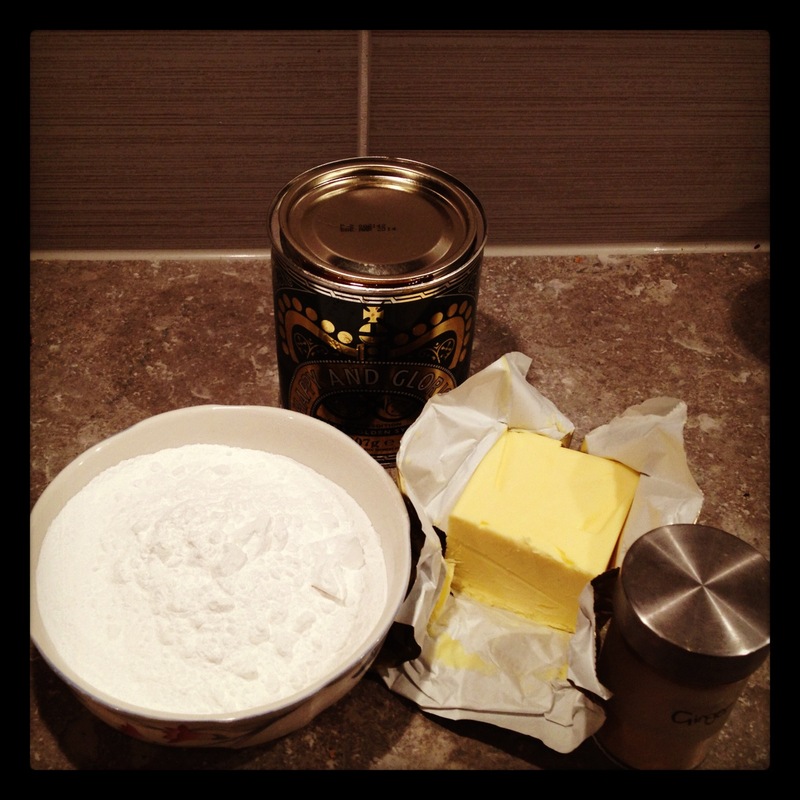 Once the butter is melted give it another minute so that the sugar is totally dissolved, then add in the flour. At this point I make sure hob is on the lowest setting – you want the flour to mix in and cook a bit but you don’t want anything to burn or stick. Give it a couple of really big stirs. Mix in all the other ingredients. Turn off the heat and stir until everything is really thoroughly combined. Pour the mixture into the prepared tin. 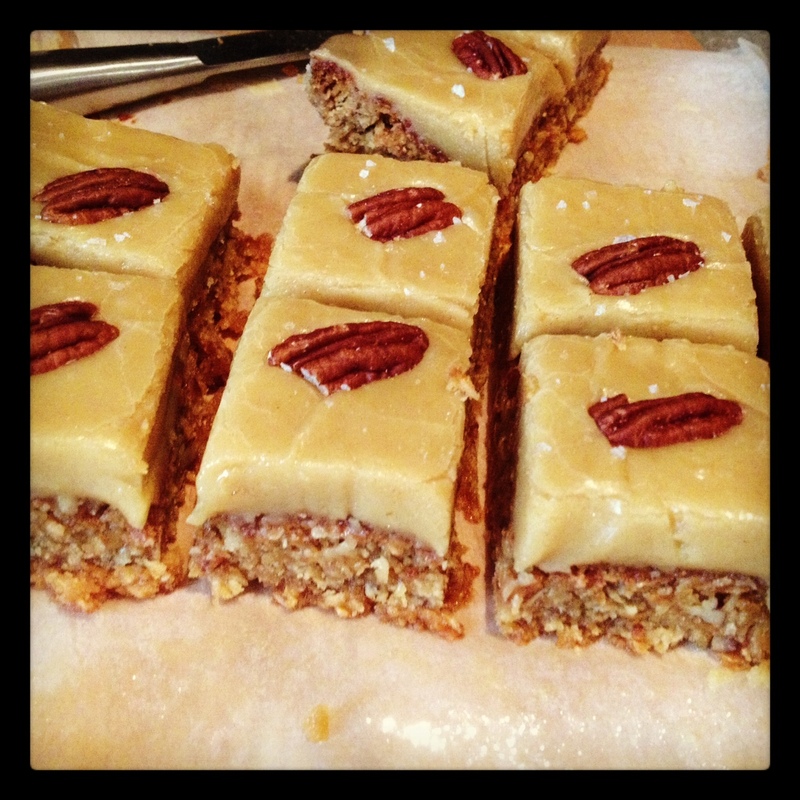 Its quite runny for a flapjack mix but don’t worry – it’ll all sort itself out! Pop into the oven for 35 mins. It’ll still be really wobbly when you take it out, but as it cools will set hard. Leave it in the tin. You don’t need to wait for it to cool to ice it, so once you’ve removed the tin from the oven get going on the icing. INGREDIENTS FOR ICING: 175g butter (basically two packs of butter for the whole recipe), 200g icing sugar, 4tbsp golden syrup, ginger to taste (I used 4 heaped teaspoons but I like it quite strong), maldon salt flakes and whole pecans to decorate. Put the icing sugar, butter, golden syrup and ginger in a pan and slowly melt over a low heat. If you aren’t sure how gingery you want it to be, put 3tsp of ginger in, stir it through and then taste before deciding whether or not to add more. 4tsp makes for quite a gingery kick. Pour the icing over the flapjack (still in the tin) and let it all cool down together. While it is still warm sprinkle over the salt flakes. Don’t overdo it but you want enough to balance out the sweetness of the icing. 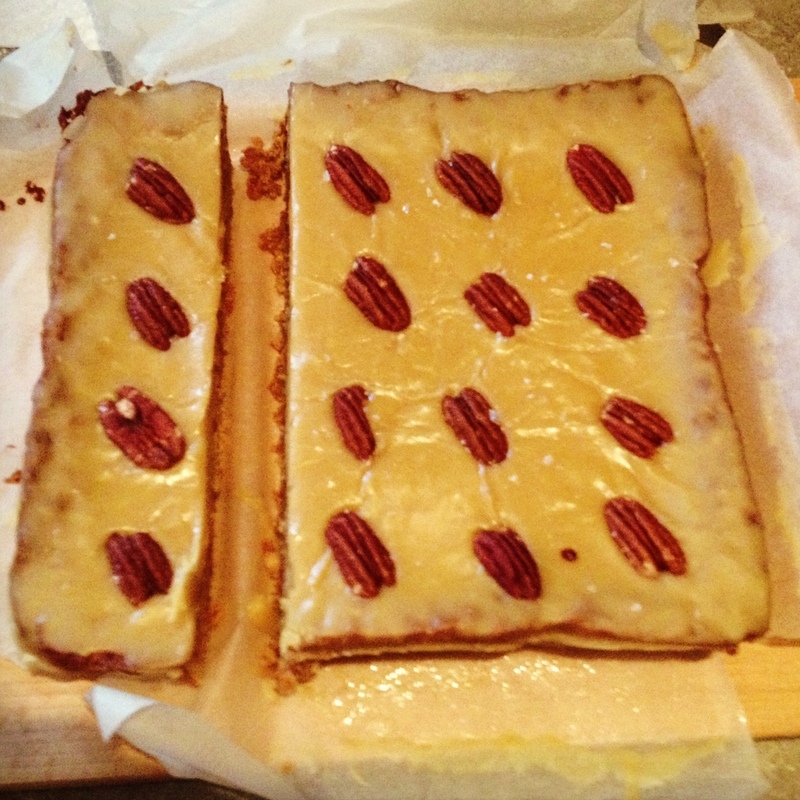 Work out how many squares you are able to cut it into, and pop a pecan in the middle of each one. This is really sweet, so I suggest small portions. The pecans look pretty and make it easier to cut as they offer up a guide! I made 16 squares. All iced and ready to cut into portions. The pecans are a good cutting guide for even sized pieces! Once you have cut up your portions you can pop them in the fridge to harden up the icing, but make sure you take them out at least 15 mins before you want to eat them so that they aren’t as hard as rocks! You can also keep them in an airtight container out of the fridge and they will last quite happily for about 3-4 days. All ready for eating! 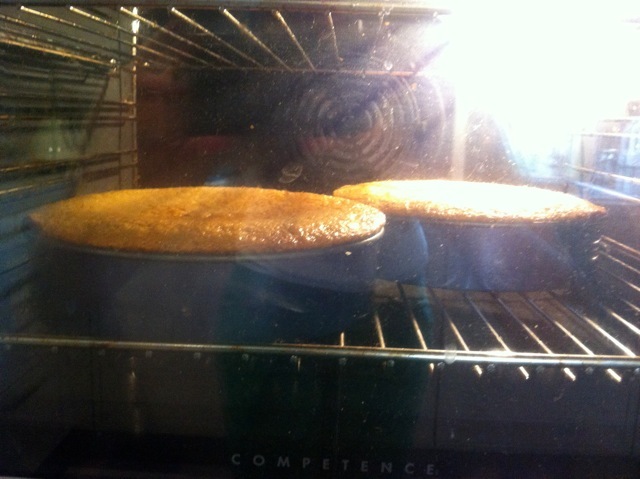 The icing will be thicker on the middle pieces as the centre of the flapjack will sink a bit as it cools. These pretty pieces will look the best presentation wise so its worth putting them at the top of the pile! In the end, I think these were actually better than the ones in the gallery cafe as they were slightly less chewy and had a better depth of flavour. Anyone else like a bit of spice or salt with their sweet? The proof of the pudding (or cake) is in the eating. That said, sometimes its good to get the other senses involved. Its been a right old miserable weekend and when its wet and cold, its nice to fill the house with the nice warming smell of baking, followed by the all important eating! So today I made a ginger cake. 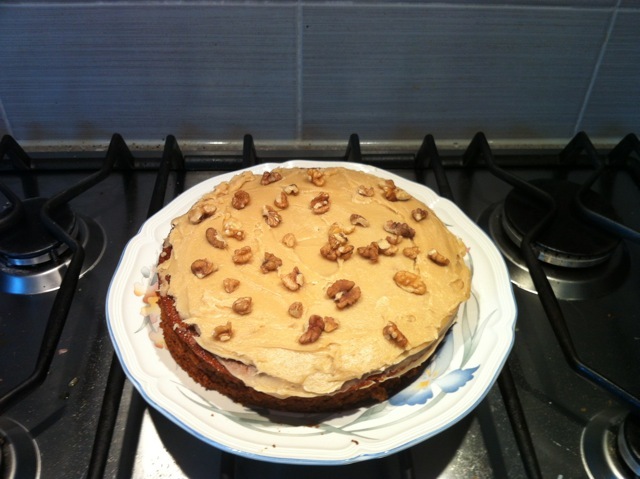 I’ve made it before, its an excellent cake, which I previously made without icing. But I also have a recipe for ginger cupcakes with fudge icing so I thought I’d try a bit of a recipe combo and see what happened. The verdict? Well, according to my chief taster (Mr. Bandit) it was ‘mmmmmmmm nomnomnommmmm’. I think that’s a thumbs up. Personally, I think its rather nice without any icing too, and its so moist and sticky that it doesn’t need any icing. But then again, when is icing really a necessity? Either way its very yummy! The best thing about this cake (other than the taste) is the amazing smell as its cooking; a heady mix of ginger, golden syrup and cinnamon. Eat it still warm and a little squidgy and it’s a delight for the fingers and the taste buds. And before I get all Nigella on you, I’ll pass on the recipe….. The most critical part of this cake is the tin preparation. 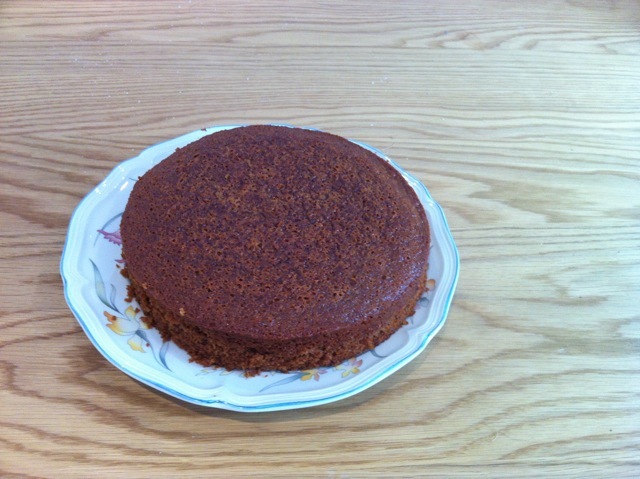 The cake is sticky and fragile, so make sure you grease and line the tin (base and sides). I ran out of baking paper and only lined the base so my cake sides didn’t come out as smooth as I would have liked. If you’re icing it, its not such a big deal but if you want to serve it plain, its worth making the effort to keep it looking nice. heat the oven to 150c (fan oven). Grease and line your tin/s – I make two 20cm cakes and freeze one but you can make one bigger cake (26cm) and just adjust the cooking time. Then melt a 250g block of margarine, 50g of butter and 400g of golden syrup in a pan on a low heat. You don’t want it to cook, just melt all together. TOP TIP: Brush some oil round the bowl and spoon you use for measuring the golden syrup. The syrup will then run off the spoon/out the bowl easily without the mad sticky mess that usually comes with golden syrup. Also, you can make this entirely with margarine, in fact the original recipe I used didn’t include any butter, but I like it. Don’t try and use all butter though, it’ll be far too rich. Don’t worry, the cake doesn’t come out tasting margarine-y. Use a food mixer and throw into it/a bowl 130g plain flour, 225g self raising flour, 110g of light brown sugar (caster sugar would work fine and dark muscavado sugar would make it a darker and richer cake) a pinch of salt and a big teaspoon each of cinnamon and ginger. Give it all a mix! Beat an egg and then throw that into the mix and give it another whizz round in the mixer. With the mixer running, poor in the melted marg/butter/syrup mixture and keep whizzing! Poor 175ml of warm water over 1 and a half teaspoons of bicarbonate of soda and then poor that into the mixer as well. When everything is thoroughly mixed poor it into the tin/tins. Don’t worry about the consistency – its a very runny mix! While its cooking it looks a bit like an aero as the light mixture cooks in all those lovely air bubbles. This is after about 20 minutes. The smell is amazing. If you’re cooking two 20cm cakes cook them at 150c for 50 minutes and then poke them with a skewer. If the skewer comes out clean, they’re done! Otherwise give it another 5-10 minutes and then check again. The very centre of the cake will still look a bit undercooked and will be very springy, but it hardens as it cools. If you’re cooking one big cake, give it an hour and then check. The cake goes a very dark brown and the top will be very sticky. When they’re done, leave in the tin/s on a rack for 10 mins. I would suggest that, unless you’re going to freeze the cake, keep it/them on the base of the tin. Its a fragile cake and getting it off the base is tricky. I suggest getting a small upturned bowl on the worktop, place the cake tin on top and then push the sides of the tin down, rather than trying to push the cake up. If you don’t fancy icing the cake, its rather nice still a bit warm, maybe with some ice-cream. Otherwise, leave it to cool ready for icing. If you are very greedy (and I am very greedy so I can attest to the fact that there is nothing wrong with that!) then here’s a recipe for a fudge icing. This is very sweet, so I haven’t made too much. The following ingredients are for icing one 20cm cake. Just double it for a bigger cake. Melt 25g butter and 50g light brown sugar in a pan. Unlike with the cake, you do want this to boil. When its boiling add 2 generous tablespoons of single cream and turn it down to a simmer. Give it the occasional stir but let it simmer for 5 minutes. Turn off the heat and beat in 100g of sifted icing sugar until smooth. Now, the important thing about this icing is speed. As soon as its make you need to get it on the cake. It starts setting the minute it leaves the warm pan. I suggest taking a big spoon and spreading it a dollop at a time round the cake, rather than pouring it all on the cake at once, because you’ll just get an icing mountain in the middle of the cake. Before it goes completely hard you can sprinkle on some chopped nuts (I used walnuts – I’m still trying to get shot of my passover stash of nuts) or chopped up stem ginger to cut the sweetness of the icing and add another gingery hit. This recipe is based on one I found in Good Food magazine, which apparently is a wartime cake – hence the use of margarine rather than butter. Happy sunday baking one and all.